From left are Solid Waste Management District Coordinator Jeff Walls, Jefferson Twp. Trustee Robert Stroud, County Commissioners President Brenda Woods, Trustee Joe Panetta, Jefferson Twp. Fiscal Officer Donna P. Lansing, and Trustee Dale Cochran. 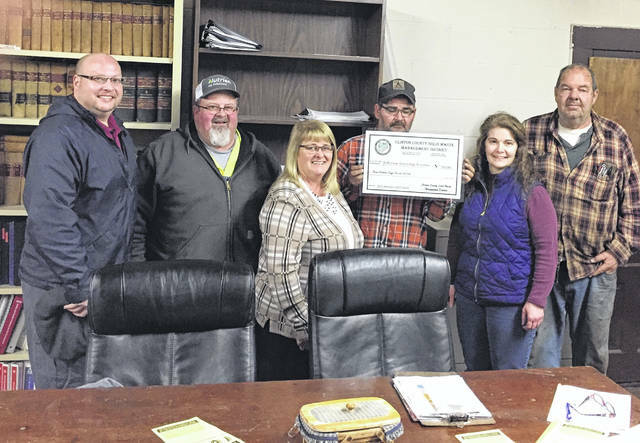 The Jefferson Township Trustees were recently awarded a 2019 Community Grant of $765 from the Clinton County Solid Waste Management District. These funds, along with matching funds, will be used to host a spring cleanup event for Jefferson Township residents. At Monday evening’s township meeting, Clinton County Board of Commissioners President Brenda Woods and Solid Waste District Coordinator Jeff Walls officially presented the township trustees with their grant award. Residents interested in participating in the spring community cleanup are encouraged to contact the township trustees or to watch for more details, which will be posted at the Jefferson Township Meeting House at 13505 US 68 South in Westboro.